RS Components has expanded its lighting portfolio and provided more options for engineers and lighting designers with the introduction of a series of high-power LEDs from OSRAM that offers innovative packaging. 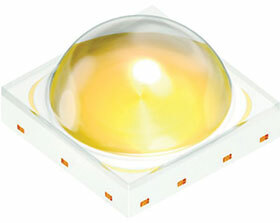 Rather than using traditional and costly ceramic-based packaging for professional exterior lighting applications, the OSRAM OSCONIQ P series of high-power and ultra-high-power LEDs employs epoxy-based packages that offer outstanding reliability, long-term performance and excellent light output. To achieve this high-level performance, OSRAM has leveraged its experience in automotive markets and combined its lead-frame technology together with its high-power chip capabilities to deliver a wide range of mass-market lighting applications, including the architectural, industrial and agricultural sectors. The OSCONIQ P series includes the P2226, P3737 and P7070 families. The first of these – the P2226 – is a white and colour LED series that offers a full mid-power colour portfolio, along with high levels of corrosion resistance. The family also combines a compact package with a footprint of only 2,6 x 2,2 mm along with high performance and wide current and temperature operating ranges, thereby enabling high design flexibility in professional lighting markets including horticultural lighting in agricultural environments. Enabling very compact luminaire designs, the P3737 family offers long lifetime and a high light output with a minimised package size. The family includes a 2 W and a 3 W version and is suitable for professional outdoor lighting such as street or tunnel lighting. Targeting outdoor lighting and industrial luminaires in particular, the ultra-high-power white-colour P7070 family offers 8 W of electrical power performance. It can enable a significant reduction in system costs for lighting designers, offering excellent thermal behaviour and best-in-class reliability. The family also offers a wide selection of lenses for secondary-optics applications.